At last count, there were nearly 4,000 publicly traded companies in the United States. That's a lot to choose from if you are an investor, so figuring out what stocks to buy can feel overwhelming. Before investing your hard-earned money into shares of a company, it's best to ask the right questions. Doing so could be the difference between owning a profitable investment or a bust. 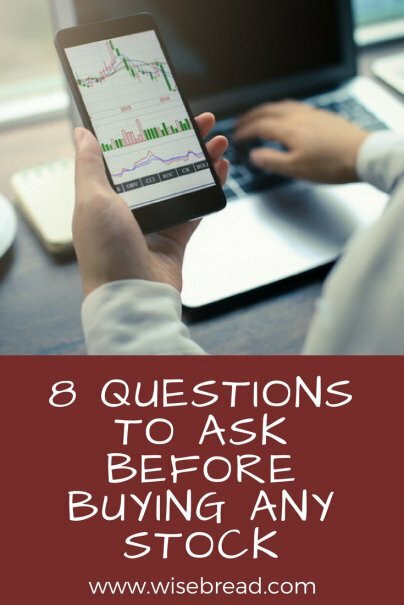 Here are some key questions to ask before making a stock purchase. This should be your very first question when buying a stock. It seems obvious, but sometimes people are so wowed by the buzz surrounding a company that they don't figure out the basics. if you plan to own shares of a company, you should have an idea of how it makes its money. If you don't have a good sense of the company's business model, how can you evaluate whether it's a good investment or not? Usually, you can get a solid understanding of a company by doing a modest amount of research. But there are some companies that are extraordinarily complex, and others that are even cagey about how they get revenue. If faced with one of these companies, it's probably best to hold off on buying shares. 2. What are the company's revenues and earnings? There are many factors that drive a company's stock price, but one of the most important things is its financial performance. The two key figures to know are revenue — how much money the company brings in — and earnings, which is another term for profit. The higher these numbers, the better, but it's important to not analyze revenues and earnings in a vacuum. Compare these numbers to figures from the previous quarter and the same quarter a year prior. Also compare their performance to competitors in the industry. Additionally, investors should not only look at total earnings, but earnings per share, or EPS. So for example, if a company had $20 million in earnings and has 10 million shares, the earnings per share would be $2. Again, look at what's normal for the industry, and compare that to the EPS of the company you're considering investing in. Examining revenues and earnings will give you a good sense of the financial health of the company, and whether it's worth investing in. 3. What is its historical performance? While it is true that past performance does not necessarily predict future returns, a long track record of good returns is a positive indicator for most stocks. If you come across a stock that has decades of consistent, solid returns, you can buy shares with some degree of confidence. A stock with a shorter track record of success may bring greater risk and uncertainty to investors. 4. Does it pay a dividend? Many companies choose to distribute a portion of their earnings to shareholders each quarter. These quarterly payments are called dividends, and they can be a powerful source of passive income for many investors. Healthy companies are able and willing to pay sizable dividends to shareholders, though some choose to keep their cash and reinvest it instead. Amazon is one example of a strong company that chooses to focus on growth rather than pay dividends. Generally speaking, companies that pay out hefty dividends tend to be more stable but don't grow as quickly. Utility companies usually fall into this category. If you are closer to retirement, you may wish to have more dividend stocks in your portfolio to protect your savings and replace income when you retire. If you are further away from retirement, you may be more inclined to eschew dividend stocks in favor of those that are more focused on growth. 5. What is its price-to-earnings ratio? It's not easy to figure out whether a company's stock price is too high or too low. One helpful indicator, however, is the ratio of the stock price relative to its earnings per share. There is no magic ratio to look for, but you ideally want to avoid price-to-earnings ratios that are too high, because it could mean a stock is overpriced. Good P/E ratios can vary by industry; a growing tech company can have a P/E ratio over 20 and be sensibly priced, while a manufacturer may be overpriced with a ratio of 10. 6. What is its market capitalization? Market capitalization is just a fancy term for size. It's the value of all the company's outstanding shares multiplied by the share price. So, a company with 10 million shares that sell for $100 each would have a market capitalization of $1 billion. Large-cap companies generally have market capitalizations of $10 billion or more. Mid-cap stocks have market capitalizations of $2 billion to $10 billion and small caps have market capitalizations of $300,000 to $2 billion. A well-rounded stock portfolio should have a good mix of larger companies with small and medium-sized firms as well. Larger companies tend to have more stable stocks, which are good for longer-term investing. Small companies, particularly in sectors like technology, can have higher returns in the short-term but may be more volatile. Understanding a company's size will help you grasp a stock's growth potential. 7. Does it operate domestically and internationally? When researching a stock, it's helpful to get an understanding of where, geographically, the company gets its revenues. If a company has growing overseas operations, this can give you an idea of whether there is room for growth. After all, the U.S. makes up only about 5 percent of the world's population. A well-diversified portfolio should include some exposure to international markets. And if you own shares of U.S.-based companies with big overseas operations, you may not need to invest directly into international firms that you may not be as familiar with. 8. Does the company have a "moat?" Warren Buffett, one of the world's most successful investors, often speaks of a company's "moat." What is a moat? Well, we think of it as a body of water that protects a medieval castle, but in investing terms, it's anything that gives a company a competitive advantage and cushion to survive challenging times. A company like Walmart, for example, can thrive in both good economic times and in bad because it sells products with low prices. Facebook is another company with a wide moat, due to its massive edge in users over other social media companies. When considering a stock, understand that the larger the moat, the more resilient the company. And that's great for investors.